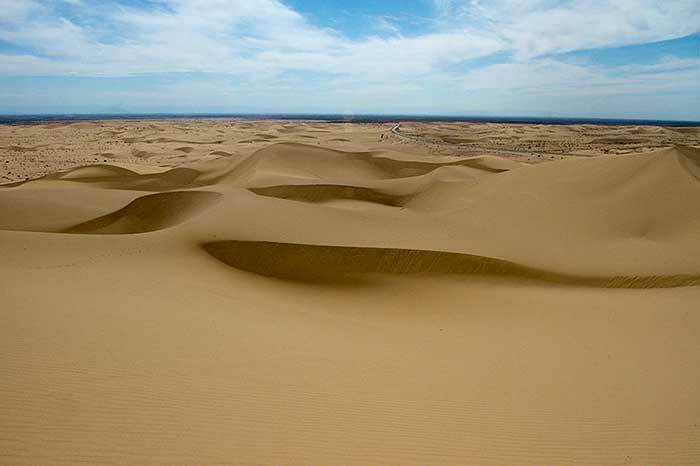 Sand covers only about 20 percent of the Earth's deserts. Most of the sand is in sand sheets and sand seas--vast regions of undulating dunes resembling ocean waves "frozen" in an instant of time. 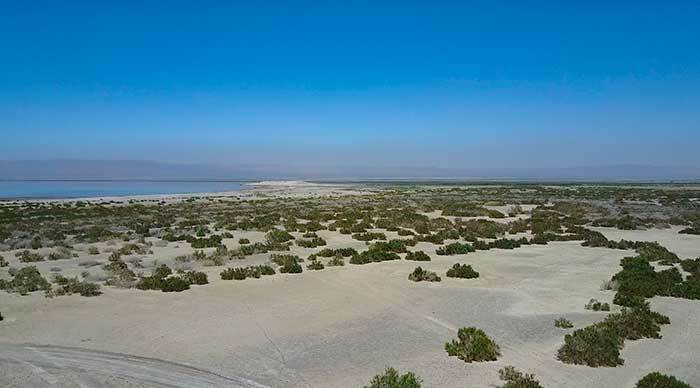 Nearly 50 percent of desert surfaces are plains where eolian deflation--removal of fine-grained material by the wind--has exposed loose gravels consisting predominantly of pebbles but with occasional cobbles. Soils that form in arid climates are predominantly mineral soils with low organic content. The repeated accumulation of water in some soils causes distinct salt layers to form. 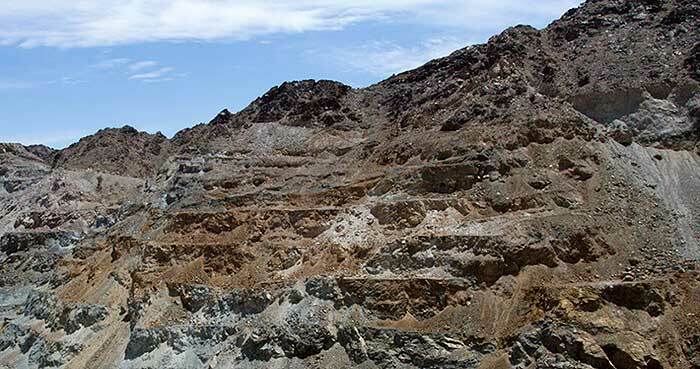 Calcium carbonate precipitated from solution may cement sand and gravel into hard layers called "calcrete" that form layers up to 50 meters thick. Caliche is a reddish-brown to white layer found in many desert soils. Caliche commonly occurs as nodules or as coatings on mineral grains formed by the complicated interaction between water and carbon dioxide released by plant roots or by decaying organic material. Most desert plants are drought- or salt-tolerant. Some store water in their leaves, roots, and stems. Other desert plants have long tap roots that penetrate the water table, anchor the soil, and control erosion. The stems and leaves of some plants lower the surface velocity of sand-carrying winds and protect the ground from erosion. Deserts typically have a plant cover that is sparse but enormously diverse. The Sonoran Desert of the American Southwest has the most complex desert vegetation on Earth. The giant saguaro cacti provide nests for desert birds and serve as "trees" of the desert. Saguaro grow slowly but may live 200 years. When 9 years old, they are about 15 centimeters high. After about 75 years, the cacti are tall and develop their first branches. 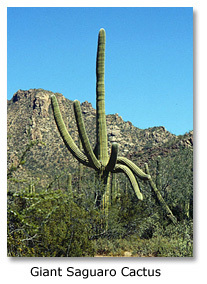 When fully grown, saguaro are 15 meters tall and weigh as much as 10 tons. They dot the Sonoran and reinforce the general impression of deserts as cacti-rich land. Although cacti are often thought of as characteristic desert plants, other types of plants have adapted well to the arid environment. They include the pea family and sunflower family. Cold deserts have grasses and shrubs as dominant vegetation. Rain does fall occasionally in deserts, and desert storms are often violent. 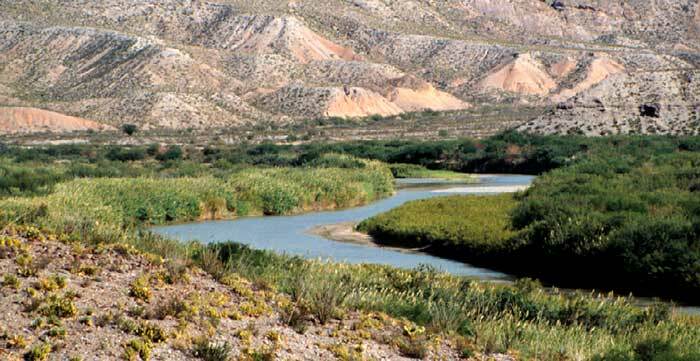 Normally dry stream channels, called arroyos or wadis, can quickly fill after heavy rains, and flash floods make these channels dangerous. More people drown in deserts than die of thirst. Though little rain falls in deserts, deserts receive runoff from ephemeral, or short-lived, streams fed by rain and snow from adjacent highlands. These streams fill the channel with a slurry of mud and commonly transport considerable quantities of sediment for a day or two. Although most deserts are in basins with closed, or interior drainage, a few deserts are crossed by 'exotic' rivers that derive their water from outside the desert. 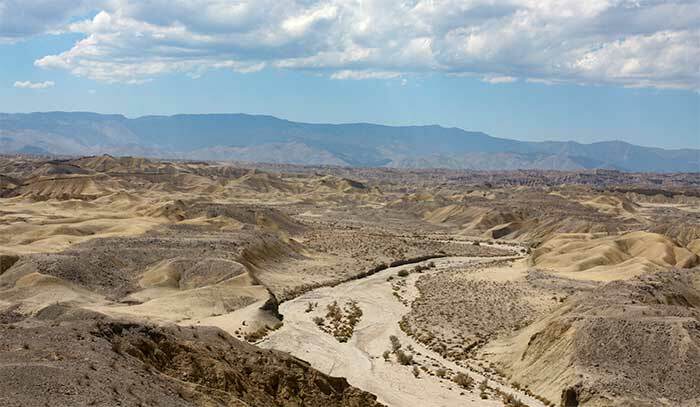 Such rivers infiltrate soils and evaporate large amounts of water on their journeys through the deserts, but their volumes are such that they maintain their continuity. The Nile, the Colorado, and the Yellow are exotic rivers that flow through deserts to dellver thelr sediments to the sea. Running water created canyon in arid Big Bend National Park, southwest Texas. There are more than a hundred playas in North American deserts. Most are relics of large lakes that existed during the last Ice Age about 12,000 years ago. Lake Bonneville was a 52,000-square-kilometer lake almost 300 meters deep in Utah, Nevada, and Idaho during the Ice Age. Today the remnants of Lake Bonneville include Utah's Great Salt Lake, Utah Lake, and Sevier Lake. Because playas are arid land forms from a wetter past, they contain useful clues to climatic change. The flat terrains of hardpans and playas make them excellent race tracks and natural runways for airplanes and spacecraft. Ground-vehicle speed records are commonly established on Bonneville Speedway, a race track on the Great Salt Lake hardpan. 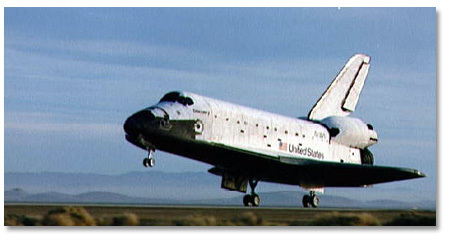 Space shuttles land on Rogers Lake Playa at Edwards Air Force Base, California.